For some reason I didn’t document my workouts last week on dailymile. Weird. Basically I have no recollection of exactly what I did. I know I worked out on Wednesday & Thursday because I was stupid sore on Friday and on Saturday for the 5k I ran. 5k spoiler alert: I did not PR. But even if I did, I wouldn’t know since the race administrators forgot to put our timing chip in our race bag, so yeah. We weren’t timed. I was going to upload what my Garmin says but apparently it’s dead and I don’t have the cord to charge it. It was somewhere around 37:22 I think. I’m all out of shape for Training Tuesday. Ha. Out-of-shape. I kill me. I did feel super adorable though in my running skirt. So I caved and bought another one. Different brand, so fingers crossed it works just as well! I’ll post a review of the race soon – even though I have limited pictures (uh, pretty much just the one you’re seeing above) Bad blogger award goes to meeee. YOU LOOK SO GOOD IN THAT PICTURE. And what race FORGETS the timing chips?? Seriously?? That stinks that there was no timer. Seems like a BIG thing for them to miss at a race! Oh well. So glad you are keeping up w/ your running. Good for you. 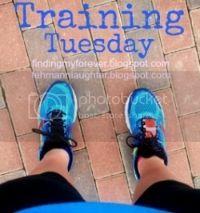 No "Training Tuesday" from me, either, but I'll get a race recap of my triathlon posted soon. I haven't bought a running skirt, but I keep seeing my running blogger friends talking about them. They ARE really cute. Also, don't even worry about not taking pictures. Sometimes people take way too many (here's looking at me), so someone needs to balance it out. YAY for you!!! 37:22 is a fabulous time, even if it's off by a few seconds!! I need a running skirt.